Vibration analysis of a wobbly fan using PicoScope. To illustrate the problem of mechanical vibrations, we modifed a desktop fan by adding a nut and bolt to one of the blades to introduce an imbalance and provide some undesirable wobble to analyze. We also add a piece of reflective tape to act as a marker for an optical sensor to allow us to accurately measure the rotation frequency. 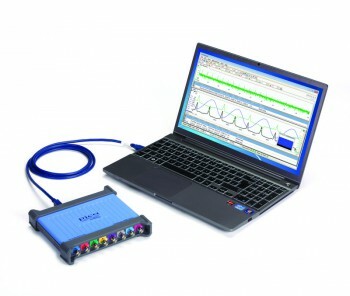 A PicoScope 4000 (8-channel oscilloscope used here though only 2 channels are required for this set-up) provides 12 bit high-resolution data acquisition, ideal for electromechanical sensors and providing wide dynamic range for FFT analysis. An optical sensor is positioned over the reflective tape to provide a single pulse for each rotation of the fan. An accelerometer is positioned on the fan with a magnetic mount with the output connected to channel B of the 4000 scope. The PicoScope display shows the time-domain view in the top window of the pulses from the optical sensor. Each pulse represents a single rotation of the fan at the position of the reflective tape. The lower window is the spectrum view of the pulsed waveform with rulers postioned on the fundamental at 17.98 Hz and the 2nd harmonic at 35.88 Hz. The display is zoomed in on the first dozen or so harmonics. The display also shows the output from the accelerometer in red with its respective frequency spectrum. It is no surprise that in this case that the wobble is the same frequency of the fan rotation. It can also be deduced from the phase relationship where in relation to the marker the peak of the wobble is occurring. This can help identify corrective action required to rebalance the machine. Vibration testing takes many forms and for a wide range of purposes. Another example: introducing vibration to a structure over a range of frequencies may produce unexpected peaks in the frequency domain that show resonances in the structure that could lead structural failures under certain environmental conditions. Many accelerometers may need to be mounted in various positions and covering all three axes of movement and many channels of data acquisition may be required. The Picoscope 4824 8-channel oscilloscope could be an ideal choice.